When my daughter was born, she spent the first nine weeks of her life in hospital. On the blessed day she was allowed to come home she weighed the grand amount of five pounds and four ounces, and was a tiny and delicate porcelain doll baby with almost translucent skin and barely any hair. As you can imagine, her early birth and subsequent hospital stay was a traumatic time for us all. She was the first grandchild for both sides of our family and so, from the day of her arrival, was treated with such love from everyone it was almost overwhelming. We got cards and gifts from people we didn’t even know, who had heard about her early arrival and wanted to send their best wishes. I still have them all. As a consequence of her tiny stature, I’ve always thought of her as being delicate and fragile, and I’ve been guilty of treating her in that way – as though she might break easily. But recently, that’s begun to change. Even though her end of year report talked of her being ‘gentle and quietly spoken’ she is beginning to surprise me in so many ways. She’s athletic, bold and brave. She’s one of the tallest children in her class, and even though she has a tiny hand-span waist (making clothes buying a nightmare), she also has a six pack of muscles! Perhaps a lot of this is merely that she’s growing up, but I’m beginning to see that my ‘cotton-wool’ treatment of her was wrong. I’ve never really behaved the same way with her younger brother, (who I consider to be relentless in his pursuit of life, even when he’s clinging to me) and so I do think that it’s a hangover from those days when I had to sit by her incubator, unable to do little more than watch her breathe. This was highlighted to me hugely when we were on holiday last week. We went to the Isle of Wight (which I’ll write more about in another blog) and spent a day at Blackgang Chine. Now, if you went to Blackgang Chine when you were a child, you’ll know it’s a cliff-side theme park, and some of it really and truly remains the same as when I was a child – and the kids are still enjoying it so much. The place was packed full, and it was so great to see that in a time when we’re constantly told that kids don’t play outside, and as a consequence of too much TV have lost their imagination, that if you provide the right backdrop (a fairy castle, or a pirate ship that fires water, or a cowboy town) that imagination is alive and well. It was like being in the middle of an Enid Blyton novel, or perhaps ‘Just William’ might be more fitting! 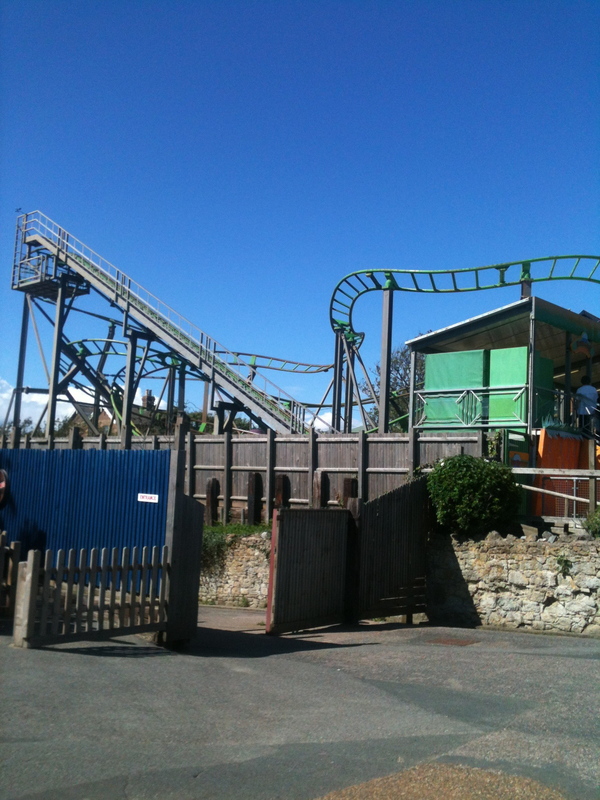 Anyway, one of the new things at Blackgang Chine is a roller coaster. A proper, scary, roller coaster. It’s only short, but there were plenty of screams coming from it when my daughter announced that she wanted to try it. Now, that in itself was a surprise. However, she duly queued with her dad, having found out that she was just tall enough (at five) to go on it. Heart-in-mouth, I watched as they took their place on the ride. From what I could see from the ground (waiting with her younger brother) they seemed to be having fun, but at the end, I waited by the exit anxiously for them to appear. They didn’t come out and so I was imagining all kinds of horrific accidents, or perhaps just buckets of tears. But, and I bet you know what’s coming already, she loved it so much she stayed on for another go…and then two more. Followed by three times down a terrifying water shute, in the dark. I think that we get assigned a role in a family, and that it can stick with you forever. In my family, I’ve been thought of as the ‘academic’ one (even though I went to agricultural college, not Oxbridge!) , and my brother as the ‘practical’ one. In fact, even to this day, if we have an argument his parting shot to me is often “oh, go and read a book…” so it’s clearly a label that has stuck. Little brother, if you’re reading this, you know I’m right! The problem with such a label is that it becomes a self-fulfilling prophecy – you think that you can only do certain things, or behave in a certain way, because that’s the role you’ve been assigned or the way people think of you. This clearly isn’t true. I could be practical and my brother could be academic, if we gave ourselves the permission to be different and worked at it. If you think about it, I bet you know what role you were assigned (often unwittingly) by your family or friends, or even one you’ve given yourself. So, I’m going to try really hard not to think of my kids as being the ‘delicate’ one and the ‘relentless’ one. I want them to carry on surprising me and to be the person they want to be, whoever that is.